Sure, it’s another cheesy end of year wrap-up post. I dig these recaps – call it a guilty pleasure. It sure beats writing an entire new post and trying to come up with compelling content (hey, it’s the end of the year… I’m tired, man!). Actually, there was nothing easy about compiling the list that I’m about to give to you, and I’m sure the inclusions and omissions will piss some people off somewhere. That isn’t my intention, and this is not a best-of list by any stretch of the imagination. The following presents my Top 10 Most Interesting Wines of 2008. It is NOT a list of the best wines released in 2008. It is a list of wines that I tasted in 2008, and found the most interesting this year. They are presented with a synopsis of my tasting notes, and my reflections on why they were included in the list. Some of them I bought, some of them were media samples, others were tasted at events. No one gets special treatment once the pen hits the notebook that logs my tastings. The list is not based on scores or any other numerical rating. The wines were chosen based on my tasting notes from all of the wines that I tasted and recorded in 2008. Bear in mind that I am not employed as a wine critic, and I do not taste thousands of wines per year. I did, however, taste well over 400 wines in 2008, which I think is probably more than the average bear. I will leave it to you whether or not the Lush designation is applicable in this context (I did spit… sometimes… at least twice…). 10) 2006 Benton-Lane “First Class” Pinot Noir (Willamette Valley): Layers of strawberry jam, cherry cola & vanilla. Pure heaven with salmon cakes. I agonized over the #10 spot in this list – as you can imagine, there were about 50 wines that could have gone into this first slot. I went with the Benton-Lane because,well, it surprised me. It surprised me in that it was one of the biggest, heftiest Willamette’s I’ve had in terms of structure, but still managed to exude a definite sense of place. Balance, baby, balance. 9) 2005 Opus One (Oakville): Supple, hedonistic & built for long haul. Mint leaf & spices floating over black fruit suggest great things to come. Was the inclusion of this wine a reflection on my tour of Opus this year, and my frank and detailed discussions with their staff? Well…. duh. Of course it is (despite the fact that one visiting intern thought that I was Gary Vaynerchuk… I had the same reaction as you: “Uhm… What?!!??”). And that’s okay, because wine is an experience and is influenced by the circumstances under which we drink it. But this wine is no slouch, and it had one of the best senses of balance I’ve tasted in a long time – between Old World & New World styles, between primary fruit and secondary aromas, and between early accessibility & ageing potential. 8) 2002 Penns Woods Ameritage Reserve (PA): Bord’x style blend from PA. YES, IT’S FROM PA. Fig, prune, cedar, probably their best vintage ever. Anyone following 1WD will NOT be surprised by the inclusion of this one. This wine, for me, helped to redefine not only what PA wine is capable of, but what East Coast wine is capable of, and how well some areas of the U.S. can implement an Old World style of wine. 7) 2004 Sonoma-Cutrer “Les Pierres” (Sonoma Valley): When isn’t it a pleasure? Flint, lemon curd, citrus peel, roses, apples, cream. I could go on. I’m including this wine in my list because I’m astounded at Sonoma-Cutrer’s consistency. This is probably my favorite U.S. Chardonnay, and to date is still my favorite Chard. globally, and I’m actually more partial to the Chablis style so if you can figure that one out please explain it to me so I don’t feel as though I’m going insane. Anyway, this wine has never disappointed me, and the `04 peels away layer after layer of complexity as you drink it. 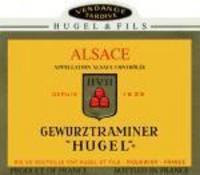 6) 2001 Hugel Gewurztraminer Vendage Tardive (Alsace): Viscous, loads of citrus, lychee, & autumn leaves. Holy Hannah it’s good! But not cheap. As a wine geek, I like to think that I can appreciate a wine made for wine geeks. And this, my friends, is a wine geek’s viscous dream. I have a sweet tooth, and while this wine certainly delivers in its touch of sweetness, the slam dunk is how the sweetness and acidity are balanced by the intense fruit and the funk-a-junk-funkiness. It’s the kind of wine that makes some people say “Hmm… I’m not too sure about this one…,” but has the wine geeks licking their lips in delight. Score! 5) 2003 Vinoptima Gewurztraminer (Ormond, NZ): Yowza! Oil, lemons, honey, orange blossoms, spice. I could sniff this stuff for *days*…! You know that you’re liking a wine when you realize, after 7 or 8 minutes of smelling it, that you love it but you’ve yet to even take your first sip. There is nothing shy about this Gewurz, and the only downside is that the booze might knock you out before you’ve gotten enough of this wine. 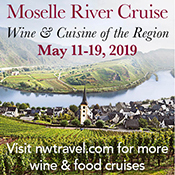 Best dry Gewurz. I’ve tasted all year. And yes, that’s two Gewurz’s in a row. On purpose. 4) NV Laurent-Perrier Grand Siècle (Champagne): Like fresh-baked almond bread with honey. A minor triumph of grace & strength. Excellent stuff. I tasted this wine at an industry event, and it stood out for me above dozens & dozens of other wines that I tasted that night. Powerful, but graceful as well, it’s like… it’s like seeing a tamed pet panther wearing a diamond-studded collar. You’re not sure how they did it, but you’re damn interested! 3) 2005 Le Premier Pas Domaine Le Pas de l’Escalette (Cot. du Languedoc): Harmonious blend of S. Rhone grapes. French red without the shackles. What do you get when you lift the AOC burden of varietals, blend percentages, and vinification and viticulture techniques from French winemakers? In the case of this wine, you get as much creativity as any New World wine, with a deliciously well-integrated result. Hey! France!! Give Us Free!!! 2) 2005 Volta Cabernet Sauvignon (Napa Valley): 1st vintage, limited run from Howell Mtn. fruit. Lush as all get-out, with lazer-focused tannins. I have a soft-spot for Volta this year. They’re fans of the blog. They’re nice peeps. And I was the first to ever review their wine in the media. They’ve since gone on to accumulate an impressive array of accolades from palates much better and more influential than mine. And they deserve it, because this wine is a tour de force of just how good Howell Mountain fruit can be when you treat it right. To get it that right on the first try is quite an achievement. 1) 1999 Gutzler Vintage Riesling Sekt Extra Brut (Rheinhessen): Stellar trad. method bubbly with peach, apricot, & non-stop creamy yeastiness. No, it’s not a typographical error. Yes, I did actually mean to list a sparkling German Riesling as my #1 most interesting wine tasted in 2008. Yes, I am sober as I type this. Number two, with a bullet! great list Dude! I can say that i only had one on your list, the Vinoptima, which I think is cool. Both of us can taste hundreds of wine in a year and still have some that don’t overlap. (I’m sure there are more!) Goes to show the diversity of the market, not that that needs to be said. Thanks, John – well said, the diversity in the market is pretty amazing at the moment. Dude, great list. Just what I would have expected from you. The unexpected. Shows lots of eclectic diversity and a true ‘explorer’s’ perspective. One of the reasons I recommend your site to anyone suffering from ‘sophmore’s’ disease. That thing where they get a little wine tasting behind them and they think they’ve got it down where, really, they’re just in a rut. Looking below this note now I see I have a very simple word verification to decipher (for a change). Excellent. Nice list, Dude. Now, can you work up a 10 course meal pairing each one with food? Then you and Mrs. Dudette can cook it up and invite me. Hey Mutineer – Late Harvest Revolution! Thanks, Steve – if you’re flying East, we’re cookin’! Sonoma Cutrer ‘Les Pierres’ ranks number seven?? Did you drink this in a restaurant? Because the winery says this wine is “restaurant-only.” Did you buy this wine in a restaurant, or are you a member of the wine drinking elite, privy to special bottles? The sparking Riesling sounds really interesting. Thanks for the post. I will have to try some of the ones on your list while that are still available!